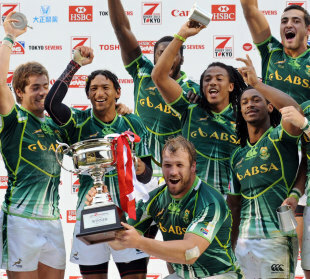 South Africa claimed the Tokyo Sevens title after overcoming New Zealand in the final of the seventh round in the HSBC Sevens World Series. South Africa fought back from 12-0 down at half time to secure a surprise 24-19 victory and take their second Cup title of the season. They struck twice in the opening minutes of the second half to take a 14-12 lead and from then dominated the game to secure the victory that takes them second in the overall standings behind New Zealand. The USA beat Scotland in the final of the Plate competition while England recovered from another disappointing first day in the competition, when they lost to Australia and Samoa, to win the Bowl competition. They beat Argentina in the final to win a second successive Bowl. The form of Dan Norton was another consolation for England after the speeedster scored two hat-tricks on day two, becoming only the 19th person to score 10 tries in a single tournament. South Africa had progressed to the final of the Cup competition thanks to a 14-12 victory over France while New Zealand beat Australia 35-17 to reach the final.